Asser International Sports Law Blog | International and European Sports Law – Monthly Report – October 2016. By Kester Mekenkamp. The fight against doping is still on top of the agenda after the Russian doping scandal. The national anti-doping organizations (NADOs) have reiterated their call for an in depth reform of the World Anti-Doping Agency at a special summit in Bonn, Germany. These reforms are deemed urgent and necessary to “restore confidence of clean athletes and those who value the integrity of sport” and secure “the public’s desire for a fair and level playing field”. The NADOs propose, amongst others things, to separate the investigatory, testing and results management functions from sports organizations, and to remove sports administrators from crucial anti-doping executive functions. They insist that “no decision maker within an anti-doping organization should hold a board, officer, or other policy-making position within a sport or event organizer”. WADA welcomed the reform proposals and pledged to discuss them at the upcoming meeting of the foundation board. The necessity of such a reform, or at least of improving the effectiveness of the anti-doping system, has been highlighted (again!) by the release of WADA’s Report of the Independent Observers concerning the 2016 Rio Olympic Games. The reports point out that “the logistical arrangements made by Rio 2016 to support the sample collection process at official venues during the Games suffered from a number of serious failings”. These “foreseeable and entirely avoidable” logistical issues resulted in a strained sample collection process. On the way forward to reform WADA you can read some ASSER proposals in a recent policy brief by our Senior Researcher Antoine Duval. Everything related to Maria Sharapova is necessarily making a lot of noise. Unsurprisingly, the CAS award on her positive doping test to Meldonium has attracted a lot of media attention. The decision in the dispute between Maria Sharapova and the International Tennis Federation (ITF) reduced the period of her suspension by nine months. The Russian tennis star had, during the Australian Open in January 2016, tested positive for the presence of Meldonium. A substance which had, for the first time, been put on WADA’s prohibited list in 2016. Subsequently, Sharapova announced she had been taking Mildronate tablets that had been prescribed by her doctor for many years. As her medical team “had failed to notice” that Meldonium was included on the list of prohibited substances, Sharapova claimed to be unaware that she committed a violation of an anti-doping rule. The CAS Panel shortened the period of ineligibility from the initial period of two years (imposed by the ITF’s judicial body) to fifteen months. It emphasized that the case turned on “the degree of fault that can be imputed to the player for her failure to make sure that the substance contained in a product that she had been taking over a long period remained in compliance with the anti-doping rules”. Given that her ban started on 26 January 2016, Sharapova will already be back in action late spring 2017. This ASSER International Sports Law blog by Marjolaine Viret, triggered by the Sharapova case, tackles the specific questions of the athletes (ir)responsibilities when taking medication. To what extent should they consult experts before taking a medication and to what extent can we assume that they are sufficiently qualified to assess the doping consequences of a specific product. . The ruling by Germany’s Highest Civil Court in the SV Wilhelmshaven case challenging FIFA’s training compensation system has been released. The BGH sided with the club but declined to pronounce itself on the compatibility of the FIFA regulations with EU law and on the validity of the original CAS award. The Asser International Sports Law Centre together with the Dutch Federation of Professional Football Clubs (FBO) organized a high-level conference on the case. You can read the conference report here. Real Madrid claim to have returned the State aid of €20.3 million it illegally received from the municipality of Madrid through various land transactions. However, the Spanish giants have also underlined that it is seeking annulment of the Commission’s decision at the Court of Justice of the EU, meaning that the saga continues despite the repayment. The “Real Madrid appeal” has not yet been registered officially with the CJEU, contrary to the appeals launched by Athletic Club de Bilbao and Valencia CF respectively. Bilbao’s appeal concerns the Commission’s conclusion that Spain’s corporate tax system was selectively favourable for the clubs Athletic Club Bilbao, Osasuna, FC Barcelona and Real Madrid CF in comparison to the other clubs in Spain. At this moment it is still unknown whether the other clubs will join the appeal. More information on this State aid decision can be found in the blog written by Oskar van Maren. In addition to its action for annulment, Valencia CF also launched proceedings for interim measures which aim to suspend the repayment of the aid until the General Court decides in the main proceedings. In parallel, the Spanish public authority responsible for ordering the return of the State aid from Valencia CF, i.e. the government of the autonomous region of Valencia, has asked the Commission to prolong the deadline for the return of the aid. These two requests need to be read in light of Valencia CF’s current financial situation. Its obligation to repay more than €23 million could well mean the bankruptcy of the Champions League finalist of 2000 and 2001. Our in-house State aid and sport expert, Oskar van Maren, will dissect all the decisions of this year in a special lecture (State aid in Football: The year of the European Commission) on 24 November. 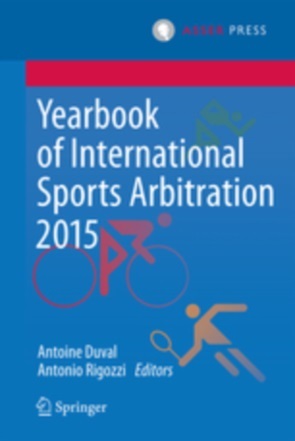 Senior Researcher and head of ASSER International Sports Law Centre, Antoine Duval, has just published with CAS expert (and lawyer) Antonio Rigozzi a new Yearbook of International Sports Arbitration (the 2015 edition is available here). 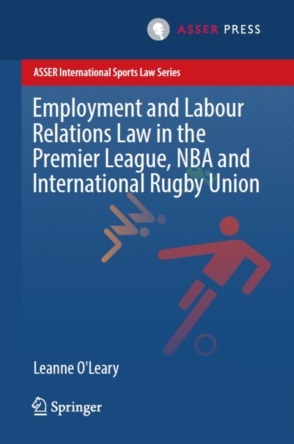 This is the first ever academic publication aiming to offer comprehensive coverage, on a yearly basis, of the most recent and salient developments regarding international sports arbitration, through a combination of general articles and case notes. Keir Radnedge, Infantino talks a good game about Fifa reform, but can he deliver? Causa Sport, Kartellverfahren gegen den internationalen Eislaufverband ISU: Das „Ein-Platz-Prinzip“ vor dem Aus? Sean Cottrell, Nick De Marco, Nick Tsatsas and Richard Berry, How does the transfer market influence the integrity of football? Nick De Marco, “Football for Sale” - What is the problem, and what are the solutions? Alice McDonald, Footballers facing tax fines: who is responsible for inaccurate tax returns? Zane Shihab and Nick Bitel, What effects have FIFA’s Intermediaries Regulations had on player representation and commission levels? Ben Van Rompuy, What can EU competition law do for speed skaters? Marjolaine Viret , Taking the Blue Pill or the Red Pill: Should Athletes Really Check their Medications against the Prohibited List Personally?